Western Cuyahoga Audubon Society is partnering with Cleveland Metroparks Zoo to develop a trail of bird nest boxes at the Zoo. The project aims to enhance the Zoo’s backyard wildlife habitat for native birds and inspire Zoo staff, volunteers and guests to learn more about northeast Ohio’s urban bird ecology. Plus, watching birds feather their nest box, lay eggs, and raise chicks is a fun and interesting experience! 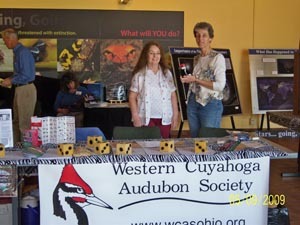 The project began in March 2010 when WCAS members observed the zoo’s old nest boxes, which were in need of replacement. WCAS members began helping to design a nest box trail plan based on the location of forests, ponds, and open grasslands at the Zoo. This past winter, Rick Ryan, a prospective Eagle Scout from Brooklyn, Ohio decided to earn his scouting wings by constructing nest boxes for the project. He built four basic designs that were specified by the Ohio Division of Wildlife. 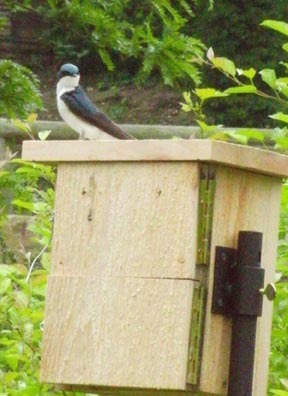 The nest boxes vary in dimension and cavity opening size so that target species of Ohio’s cavity-nesting birds like wrens, tree swallows, chickadees, and woodpeckers will be attracted to nest in them. Zoo Curator of Birds and Aquatics, Stan Searles, worked with WildBirds Unlimited to outfit the Zoo with poles and predator guards for the project. 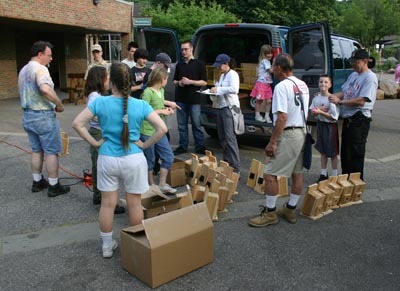 Rick’s Scout Troop then helped to mount twenty of the boxes this spring. It has been a rewarding local conservation effort with plenty of community involvement! A team of certified volunteers—also known as citizen scientists—are already helping to monitor the nest boxes in accordance with NestWatch, a project funded by the National Science Foundation and managed by Cornell Lab of Ornithology. In April, Jason Martin, Project Leader for the NestWatch program, Skyped with about 20 volunteers at the Zoo to teach the basics of bird nest monitoring. The Zoo’s citizen scientists were thrilled to observe several of the boxes being used by tree swallows and other birds within weeks. The information volunteers collect as part of the Zoo’s nest box project will contribute to a national avian database that helps biologists, natural resource managers and conservationists make informed decisions about wildlife management. Cornell researchers are also interested in learning more about how climate change impacts bird ecology, such as earlier egg laying and migration. By participating in long-term wildlife monitoring on a landscape-scale, we can better understand the science behind the birds and the bees! Cleveland Metroparks Zoo is a Certified Wildlife Habitat by the National Federation of Wildlife and supports the work of the Western Cuyahoga Audubon Society Chapter. More opportunities to get involved in nest monitoring efforts will be available once the program is fully fledged. Stay “tweeted” to learn more about the Zoo’s nest box project! If you have questions, please contact Gayle Albers, Conservation Coordinator, at gla@clevelandmetroparks.com. 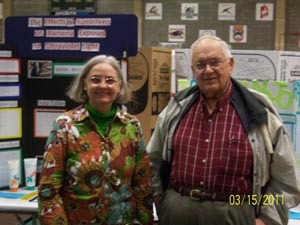 Thank you to Jan Holkenborg, Nancy Howell and Dave LeGallee for preparing, staffing and judging the Science Olympiad at Cleveland State University on Saturday, March 26, 2011. Elementary school students from 13 schools or school districts - urban, parochial, private and suburban - took part in the Bird Identification part of Science Olympiad. Calls and songs, parts of a bird, bird behavior and plain and simple identification of birds that are found in northeast Ohio were all fair game as part of their “test”. For more details see our Education Events page. 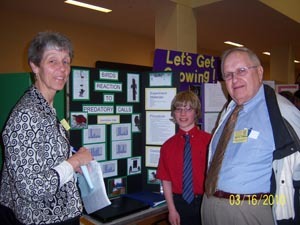 The Oil Spill in the Gulf of Mexico inspired many science projects at the 2011 Northeastern Ohio Science and Engineering Fair. More than 600 students in grades 7-12 from eighty-plus schools in seven counties competed this year. 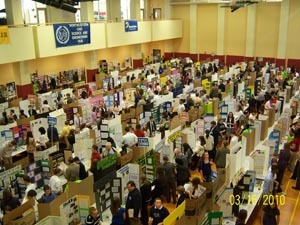 The overall winners will go on to the Intel International Science and Engineering Fair. 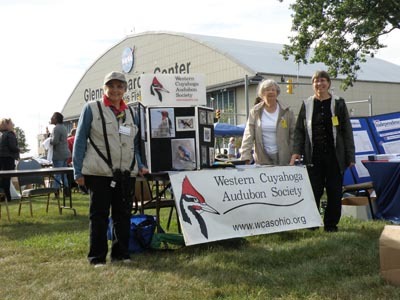 Western Cuyahoga Audubon Society awarded 3 special awards. Elena Paparizos analyzed several methods of removing oil from bird feathers. Her project “The Oil spill effect: The Removal of oil from bird feathers using household solvents” won one of our top prizes.” Elena is from St. Michael Elementary School. Erich Pocker likewise took up the challenge of oiled wildlife. His project was entitled, “Finding formulas for fixing fouled fur and feathers.” He is a student at St. Angela Merici Elementary. 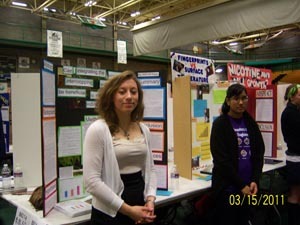 Non-point pollution was the theme of Emmanuel Garcia’s project. He sampled water in the Rainforest at Cleveland Metroparks Zoo. Emmanuel is a student at Lincoln-West High School. Other projects explored light pollution, genetically modified crops and bird song. 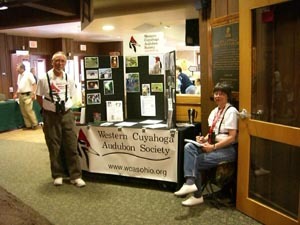 Judges for Western Cuyahoga Audubon Society this year were Dave LeGallee and Penny O’Connor. 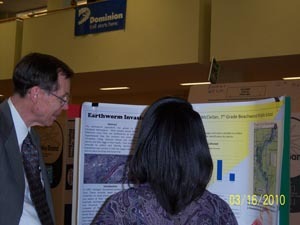 Offering awards at the science fair is opportunity for our organization to recognize the achievements of middle- and high-school science students, and to encourage their future interest in birds, conservation and the watershed. Western Cuyahoga Audubon Society and Brooklyn Centre Naturalists are partnering with Cleveland Metroparks Zoo to develop a trail of bird nest boxes on Zoo grounds. The purpose of this project is to get involved in a local conservation effort to study northeastern Ohio’s nesting bird populations. 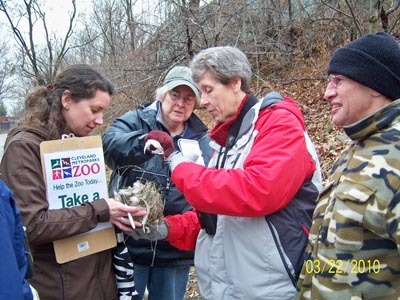 The project began in March 2010 with WCAS members observing the existing nest boxes and helping to design a nest box trail plan based on the location of forests, ponds, and grasslands at the Zoo. The project aims to enhance the Zoo’s backyard wildlife habitat and inspire Zoo guests to learn more about urban bird ecology and the impacts of climate change on bird populations. Plus, watching birds feather their nest box, lay eggs, and raise chicks is a REALLY FUN experience! When the trail is complete, trained volunteers—also known as citizen scientists—can help monitor the nest boxes in accordance with NestWatch, a project managed by Cornell Lab of Ornithology. The research will contribute to a national database about bird nesting that helps biologists, natural resource managers and conservationists make informed decisions about wildlife management. Cleveland Metroparks Zoo is a Certified Wildlife Habitat by the National Federation of Wildlife and supports the work of the Western Cuyahoga Audubon Society Chapter. Stay “tweeted” to learn more about the Zoo’s BirdNestbox Trail! We found lots of birds and a few interesting finds. See report here. Met with the Brownie Troop at Lake Isaac on Sunday at 2 PM. I took my umbrella so it would not rain … and it didn’t. Nine lively girls and 3 parents were there. 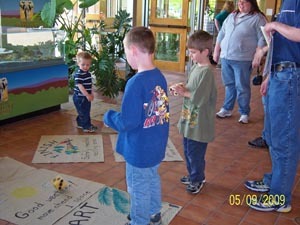 I gave the adults our Audubon literature and sent some additional with the leader. The girls all received a sticker. We checked out the different habitats around Lake Isaac. We saw deer, squirrels, Great blue heron, lots of Myrtle warblers which I was able to “pish in” close enough to see their butter butts. Chickadees were also coming in close. 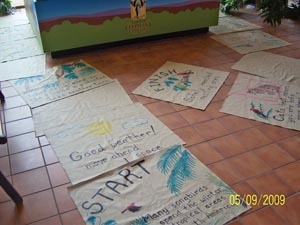 We discussed some of the litter along the way and why people litter. The girls also saw lots of stuff which opened my eyes too. It was fun. NEOSEF is an outreach activity for WCAS. Over 600 students in grades 7-12 took part. They came from schools in 7 counties. Our awards give encouragement to the next generation of science- and conservation-minded citizens. Nancy, James, & Dave with "Birds Recation to Predator Calls"
Aniah McClellan & "Earthworm Invasion"
March 2010 was a busy month for WCAS volunteers. The Wild & Scenic Environmental Film Festival played to a full house Friday, November 6, 2009 at the Cleveland Museum of Natural History. 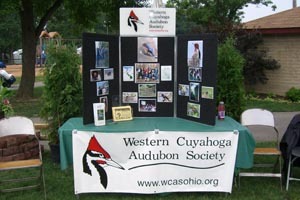 Western Cuyahoga Audubon Society was one of about a dozen exhibitors. Our table was strategically located in front of a display full of South American birds and Neotropical migrants. 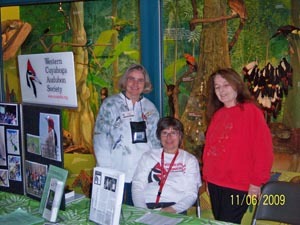 Representing WCAS were: Joanne and Terry Gorges, Penny O’Connor and Barbara Warny. As a result of our ongoing Important Bird Area Survey in the Rocky River Watershed, Cleveland Metroparks recognized the expertise of WCAS members and recruited them to survey private parcels in the Rocky River East Branch between Mill Stream Run and Hinckley reservations. The purpose of these surveys is to provide Metroparks with data on bird populations in these parcels in order to support Metroparks' grant propsals to continue William Stinchcomb's vision of a contiguous green corridor in the Emerald Necklace. 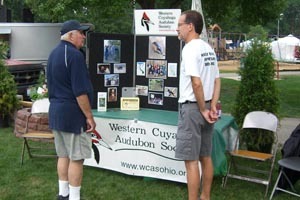 Thanks go out to Dave LeGallee for staffing the WCAS display at the School Days event on Wednesday, May 20 at Edgewater Park. About 300 youngsters and their teachers stopped by the display on Bird Identification...and the students received stickers. May 9, 2009 International Migratory Bird Day -- Cleveland Metroparks Zoo. Photos courtesy of Penny O'Connor. as was the Zoo's screech owl. Photo courtesy of Laurie Boylan. 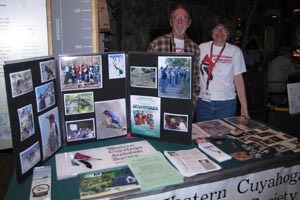 Thanks to Kit, Terry, Joanne, Barb, Penny, Dave & Laurie for promoting WCAS during North Coast Nature Festival. Western Cuyahoga Audubon Society gave a Special Science Fair Award at the March 3, 2009 Northeast Ohio Science and Engineering Fair. The winner was Cara Smith, from Incarnate Word Academy for her project “Green Streams: Does a healthy riparian zone affect a stream’s turbidity after rainfall?” Cara’s project was also picked as a winner by several other societies. 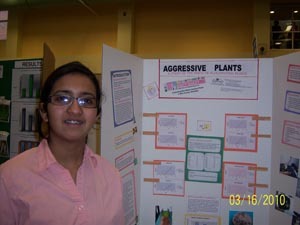 She was in the 7th-8th grade Environmental Science project category. She studied locations along Big Creek and the Cuyahoga River. 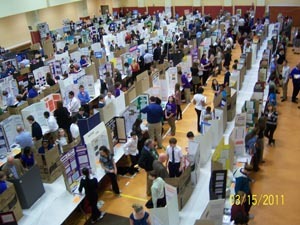 The Northeastern Ohio Science and Engineering fair gives 500 students from 80 scools a showcase for their work, and a chance to compete in the International Science and Engineering Fair. Photos courtesy of Laurie Boylan. 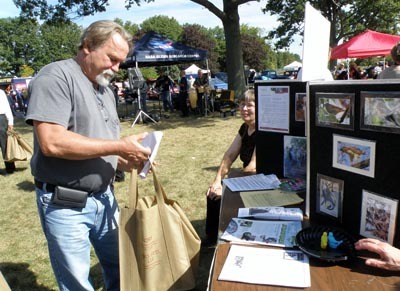 Thanks to Dave, Laurie, Terry and Joanne for telling everyone at Summerfest in Rocky River/Fairview Park about Western Cuyahoga Audubon. Cuyahoga County Fairgrounds Wind Turbine Project.